World premiere release of nostalgic score by Lalo Schifrin for 1973 United Artists production Harry in Your Pocket,, directed by Bruce Geller, starring James Coburn as a professional pickpocket. 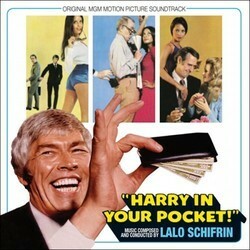 The jazz-based score of Lalo Schifrin (The Cincinnati Kid, Cool Hand Luke, Bullitt, Dirty Harry, Pussycat Pussycat I Love You, Kelly’s Heroes, The Fox) is a big surprise for the variety of themes, the importance of “source music” in the development of film, and for his main theme “Day by Day by Day”: a beautiful and melancholy tune that is one of the Schifrin’s best. The score of Harry in Your Pocket has never been release in any form until now, since the tapes are lost. In fact, in the MGM/UA vaults was only the mono Music Stem, not in too good conditions. This premiere release was produced by Nick Redman, who has used the personal tapes of the composer: three reels of two-tracks stereo 15 ips. contains the complete score. Unfortunately the vocal version of the main theme, with Bruce Geller lyrics and performed by Josh Adams, was not in the Schifrin’s tapes. We removed and restored this cue from the mono Music Stem and included at the end of the CD as a Bonus Track. The score of Harry in Your Pocket is finally full released at last. Produced by Nick Redman. Mastered by Daniel Hersch. Extensive liner notes by Daniel Schweiger, discussing the film and the music. This edition includes a 12-page full color booklet.